The Undying Lands doesn't prevent mortals from dying so, in fact, [Frodo] died... maybe sixty years (or more, if his life was prolonged) after the end of the story. If this is correct, Gimli certainly would have died. Is there any direct reference to his death (preferably with age)? Failing that, what canon states or implies that mortals will still die there? The Undying Lands might not prevent death, but the One Ring seems to. Gollum lived for over 500 years because of it. Bilbo, Frodo, and Sam all aged slowly before making their way to Valinor, even after the Ring's destruction. My impression was that because of the Ring's influence they were expected to live forever, and their residence in Valinor served not only to make them comfortable, but also (perhaps even moreso) to protect them from becoming wraiths due to the Ring's effect. So, did the Ring Bearers live until the End of Days in Valinor, or did they eventually expire, and at what age? Were they mortal once again because the Ring's power had been broken by its destruction, or the magic of the Undying Lands, or did the Valar themselves reverse it? I'd also appreciate canonical references to age at death if it did happen. Frodo is mortal, and going to Valinor doesn't change this. I don't remember this being explicitly stated in The Lord of the Rings. Book VI closes as Frodo sails away. Gandalf, Galadriel and the others do not make any prophecies regarding what will happen in Valinor. One of the appendices provides a timeline for “later events concerning the members of the Fellowship of the Ring”, but strictly limited to Middle-earth. The Ring is destroyed in 1422 by Shire reckoning, Sam sails West in 1482 when his wife dies, and Legolas and Gimli (“it is said”) are the last of the Fellowship to leave Middle-earth in 1541. That's all you'll find in The Lord of the Rings: that story is told from the point of Middle-earth and does not chronicle what happens in the Elven lands that Man cannot reach. Mortality is a gift to Men (this is clearly established in the Simlarillion). This is a gift of Ilúvatar and not even the Valar can affect it. Although Hobbits are not mentioned, they are probably close enough cousins of Men to be mortal in the same way. The case of Dwarves may be less well-established but nothing indicates otherwise. ‘Alas! there are some wounds that cannot be wholly cured’, said Gandalf — not in Middle-earth. Frodo was sent or allowed to pass over Sea to heal him — if that could be done, before he died. He would have eventually to ‘pass away’: no mortal could, or can, abide for ever on earth, or within Time. So he went both to a purgatory and to a reward, for a while: a period of reflection and peace and a gaining of a truer understanding of his position in littleness and in greatness, spent still in Time amid the natural beauty of ‘Arda Unmarred’, the Earth unspoiled by evil. As for Frodo or other mortals, they could only dwell in Aman for a limited time — whether brief or long. The Valar had neither the power nor the right to confer ‘immortality’ upon them. Their sojourn was a ‘purgatory’, but one of peace and healing and they would eventually pass away (die at their own desire and of free will) to destinations of which the Elves knew nothing. There you have it: the Ring-bearers were mortal, they remained mortal, and they eventually died in the manner of mortals, albeit after a time of their own choice. (…) But the legends are mainly of ‘Mannish’ origin blended with those of the Sindar (Gray-elves) and others who had never left Middle-earth. As this last passage shows, we don't know precisely what happened to Frodo and the other Ring-bearers in Valinor because what we know is the legends of Middle-earth. We have no knowledge of what happened in Valinor after it was removed from this Earth, save through what little contact it still had with Middle-earth until the end of the Third Age. Yes, every mortal who goes to Aman (the Undying Lands) will eventually die. The Undying Lands were likely called that because immortals dwelled in them, not because they granted immortality. As for Frodo or other mortals, they could only dwell in Aman for a limited time – whether brief or long. The Valar had neither the power nor the right to confer 'immortality' upon them. Their sojourn was a 'purgatory', but one of peace and healing and they would eventually pass away (die at their own desire and of free will) to destinations of which the Elves knew nothing." —J.R.R. Tolkien, Christopher Tolkien (ed. ), The Silmarillion, "Akallabêth: The Downfall of Númenor"
The elves believed that Tuor, a man, set sail from the havens at the mouth of Sirion with his elvish wife Idril, daughter of Turgon, King of Gondolin. The silmarrilion states that Tuor and Idril arrived safely in Valinor, bypassing the ban of the Valar, and that Tuor was accounted one of the elder race, and granted immortality after the manner of the elves. It is possible, in other words, for a mortal to live on in the undying lands like an elf. However, Tolkien indicated in his private letters that Frodo and Sam and the others were not counted as elves, and indeed died, even in the "Undying Lands." how much time it takes depends on how long you have the Ring and how much you use it. Sam had it the least amount of time (excepting Déagol, who was killed almost immediately), 2 days maximum, and gave it up willingly, so it shouldn't be expected that it had much lasting effect on him. Frodo had it about 18 years, but the Ring completely claimed him at the end and was taken off him by force; that's obviously going to have a lasting effect. Bilbo had it about 60 years, only used the Ring for tricks (and escaping from the SBs), and also gave it up willingly; he was without it for almost 20 years when he went West. Gollum had it for almost 500 years, obtained it by force, used it for evil, lost it unwillingly, and was without it for close on 80 years at his death. Obviously, in the light of Gandalf's statement, it's going to take longer for the effects of the Ring to wear off both Bilbo and Gollum. 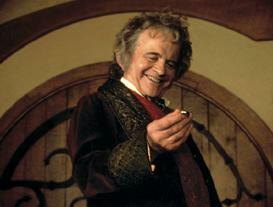 Even when we meet Bilbo in Many Partings they're still wearing off - he asks to see the Ring. Gollum of course still wants it right to the very end, and as such is still under its influence. There's another time when Manwe says he has no means to hold a man in Arda for longer than his mortal life. Only Illuvator himself can grant immortality and he did so for Tuor and he gave Beren a second life. On the other hand Illuvator didn't create Dwarves and it's unknown whether he granted them the gift of Illuvator. They were mortal, but not by Illuvator's will. So while the land of Valinor itself couldn't change Gimli's mortality, there's no clear rule that one of the Valar couldn't have granted Gimli immortality. 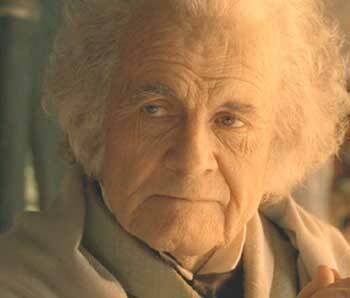 Once the influence of the ring was gone, the films show Bilbo rapidly aging to appear his true age. Remember, while Bilbo had it for longer and gave it up willingly. Frodo possessed it while Sauron was present and in power. Under his constant hunt, his constant will to draw it to himself. It is very likely that Bilbo would have succumbed to that far sooner than Frodo did. It's not just the possession but the times of possession. What effect does owning a rifle have on a man? He may hunt with it, hang it on a wall, perhaps defend his house. What effect does a rifle have in the midst of a war? How many men does he kill with? Does he question whether he had to kill every one? Does he feel guilt at his anger or perhaps even pleasure when doing so? The truth is, that Frodo bore the Ring in the midst of the war. And that burden, be it but for a few seasons, dwarfed (sorry for the pun) the many years that Bilbo and Gollum held the Ring. I believe that the Ring-Bearers and Gimli did in fact die, some time after reaching Valinor. Bilbo, Frodo and Sam went there for healing after their ordeal with the Ring, a grace that was granted to them when Arwen chose mortality. "For I am the daughter of Elrond. I will not go with him when he goes to the Havens. For mine is the choice of Luthien, and as she, so have I chosen, both the sweet and the bitter. But in my stead, you shall go, Ring-Bearer, when the time comes and if you so choose." The Return of the King, Many Partings. As for Gimli, he went with Legolas after the passing of King Elessar, because he desired to see the Lady Galadriel again, and it is said that she obtained this grace for him. But it does not say that he was granted immortality, only that he was allowed to go into the West. (I don't remember the exact words) IMHO No one can really die (unless by violence) at Undying Lands. Remember even Fëanor's mother didn't "really" die after giving birth. Are Frodo and Bilbo immortal after they go to Valinor? What does it mean to sail into the West? Why do Bilbo and Frodo gain access to Valinor? Why is Gimli allowed to travel to Valinor? In LOTR is there an afterlife?